Sidney Slon/Pipe Dream Photographer Binghamton University’s paved roads see potholes during the winter season. 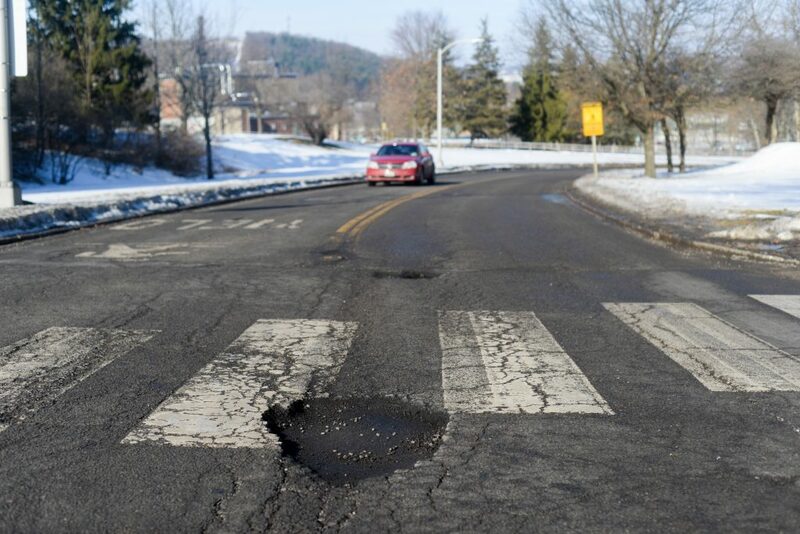 Potholes can become a recurrent part of driving on Binghamton University’s roads, and this winter is no exception. As students returned to campus after winter break, some began noticing rougher pavement. According to Karen Fennie, communications specialist for Physical Facilities, there is a reason that winter roads tend to be more broken. Fennie wrote that the state of the University’s roads is about the same as it has been in past winters. Physical Facilities intends to fully repair the potholes in the spring when temperatures are warmer. Benjamin DeAngelis, political engagement coordinator at the Center for Civic Engagement, said he notices the potholes frequently while commuting to and from work. “My car is very low to the ground, so I’m always trying to go around them,” DeAngelis said. Others, like Lesia Hrycyna, a senior majoring in Russian, are concerned about the damage the potholes could cause to their vehicles. But some students, faculty and staff haven’t noticed the potholes. Hehuanyu Li, a senior majoring in biology, said she believes the campus roads are in good conditions. Despite the potholes, many drivers on campus have greater concerns than road conditions, such as parking accommodations. Li said markers for where commuters can and cannot park is misleading. DeAngelis said the lack of parking across campus presents problems for both faculty and students.